During the 1990s and first half of 2000, Ireland had one of the longest property booms on record. Between 1996 and 2006, the average price of second homes rose in Ireland rose by over 300%. The average price of new houses rose by 250%, according to the Department of Environment, Heritage and Local Government (DoEHLG). 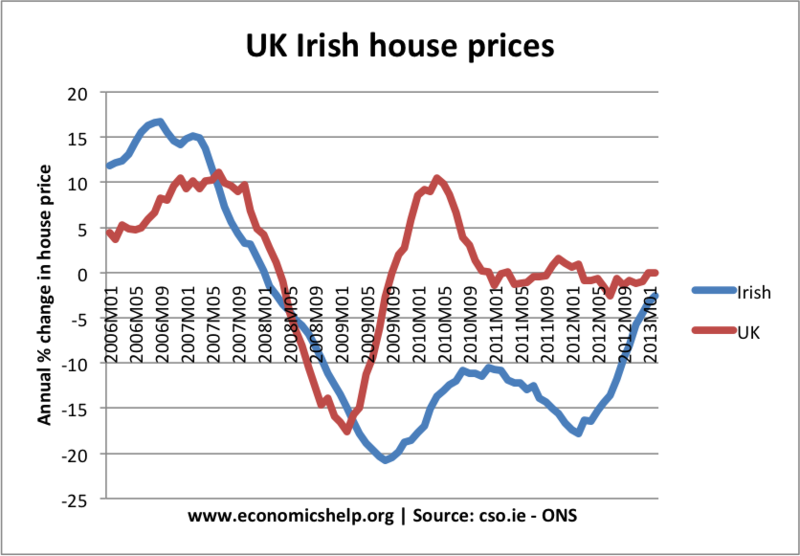 However, since the peak in early 2007, Irish house prices have fallen 50% – and there are few signs of promise for the Irish housing market. The rapid rise in Irish prices was initially a reflection of economic fundamentals. Economic growth enabling more people to be able to afford to buy. Irish house prices were relatively cheap in the early 1990s. Speculation, with property developers buying to let. Expectations of continued rising house prices encouraging people to get into property. Rising house prices encouraged home owners to take out equity withdrawal and use the money to invest in second homes. A booming and unregulated banking sector. The finance boom encouraged banks to lend more variable mortgages with lower deposit requirements – 100% mortgages were common. Also people borrowed very high salary multiplers. Mortgages upto 10 times salary were said to be given. Both property markets see a sharp fall in house prices in 2008/09. But, whereas the UK property market stabilised, Ireland continued to see one of the longest continued periods of falling house prices – making it one of the biggest global property collapses. Since 2006, Irish house prices are nearly 50% lower than their peak. 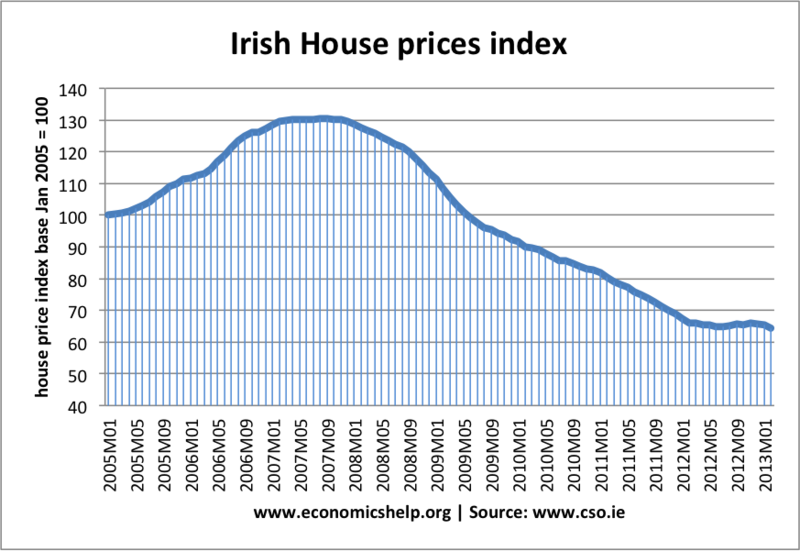 Irish house prices have collapsed for various reasons. Deep recession. The Irish economy has been very hard hit by the 2008-12 recession, with unemployment rising to 14%. At the height of the boom the construction sector in Ireland accounted for 25% of GDP and 20% of jobs. Banking losses. As a result of the credit crunch, Irish banks were exposed to significant losses which required a bailout from the Irish government. As a consequence of the bank losses, banks have reduced their mortgage lending making it difficult to get a loan. Residential mortgage lending has fallen from 64% of GDP in 2010 to 51% by end of 2011. Falling property prices have discouraged people from entering a declining property market. With interest rates at 1%, there is some hope that the Irish housing market will stabilise. There is some evidence, especially in Dublin that the fall in prices have been halted. Towards the end of 2012, there were tentative signs of house price rises in some parts of the country. However, this may prove elusive. Fitch estimate Irish house prices could still fall 20% due the large oversupply, but also the prospect of further mortgage arrears. Laws holding back repossessions could actually increase the rate of arrears as mortgage holders feel less pressure to pay (link). Burdened with austerity and high unemployment, the Irish economy is weak and will struggle to recover – especially with continued weakness in the European economy. This entry was posted in economics and tagged house prices, ireland. Bookmark the permalink. ← How does the economic cycle affect government borrowing?